ASCOT is free of charge for not-for-profit use but a licence is required. To obtain a licence you must download, complete and return our Microsoft Excel registration form via email, having agreed to the terms and conditions included. Return the completed form to the ASCOT Team at ascot@kent.ac.uk; they will review it and aim to respond within 10 working days. Watch the video opposite for guidance on how to obtain ASCOT instruments. If you are unsure which tool is right for you, go to our Which ASCOT tool? webpage. If you are interested in for-profit use, please download, complete and return this form to ascot@kent.ac.uk We may contact you for further details and then pass your form to the University of Kent’s Innovation and Enterprise team to negotiate a licence agreement. 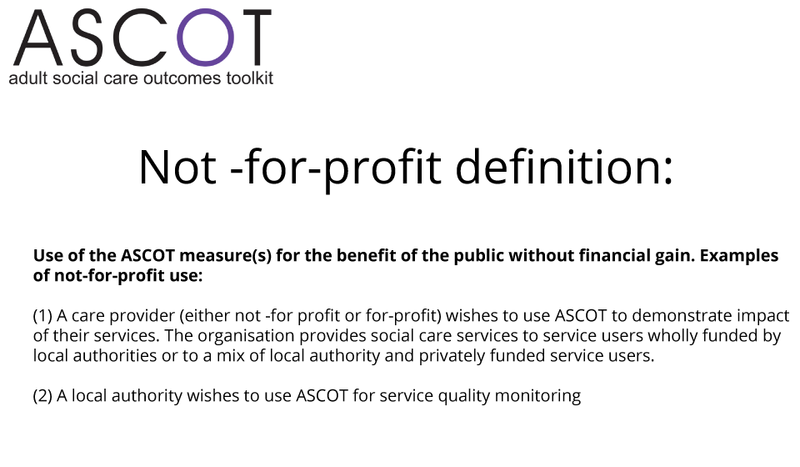 The developers of the ASCOT wish the tools to be used widely in social care to promote and outcomes approach in social care practice and policy. However, it is important that any quotations of the ASCOT questions in publications do not violate the intellectual property, which belongs to the developers (members of the Personal Social Services Unit at the University of Kent). Therefore, including the full ASCOT instruments (e.g. a complete set of questions from the ASCOT SCT4/Carer SCT4 or ASCOT INT4/Carer INT4) in publications would be considered a breach of the copyright and Intellectual Property. Authors should provide a fair and reasonable representation of the ASCOT instruments used in their research or practice. Quoting the first and the last ASCOT domain, i.e. 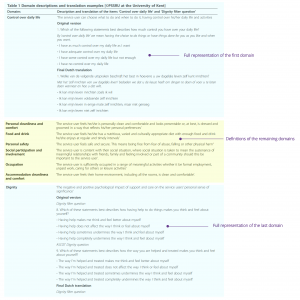 control over daily life and dignity in the service user versions of ASCOT, and occupation and feeling encouraged and supported in the Carer versions, will give the reader a good understanding of the ASCOT measure. We therefore stipulate that authors quote the questions from these domains in their publications. In addition, authors may provide definitions of the remaining domains. In some cases funder restrictions and/or preference elicitation studies necessitate full publication of the tool. In which case, contact the ASCOT team for further information.